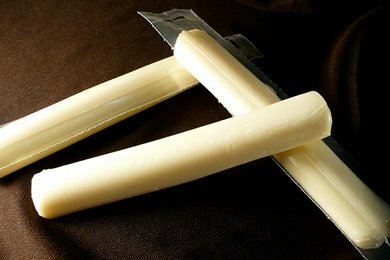 Also known as string cheese, this cheese stick is an example of a packaged snack that is good for you. Cheese doesn't usually come in this shape. It seems that cheese manufacturers are trying to make their snack more portable with this packaging, and it works. Sargento (and other brands, Horizon, etc.) have done the work of cutting up cheese into cubes for an easy "grab and go" snack. Just buy a package of these packaged cheese strips, and you are done. You get 20% of your daily supply of calcium in one little stick, and other things that your body needs like fat and protein. But, what about just cutting up cheese and putting it a container? Well, you will save money because it costs much less per ounce for the cheese, and you can be a "greeny" by saving the world from all that plastic packaging. And the taste? They don't taste delicious. They are bland, a little salty, and taste a bit like the plastic package. A really sharp Vermont cheddar will satisfy any cheese craving before a tasteless piece of Monterey Jack. If you are watching your weight, you want all of your food to taste great. You could eat cheese sticks all day and not even know you are eating them and that is a problem. Parents should not feel guilty about buying cheese sticks. They are a great quick fix for busy parents. BUT, if you have a extra time, then buy great cheese and cut it into chunks. I love the low-cal string cheese options. I buy a 24 pack at a time. As a DIY Weight Watcher I can grab one and know off the top of my head- it will set me back 1 point. I LOVE block/moon cheese, but to know points values I would have to use my scale and try to make it as exact as possible. The pre-packaged ones are great for my needs. but cheese sticks are made out of processed cheese and that isn't that great for you. I understand that, and accept it or else I would have to give my children more than one ounce to satisy their taste and mine as well. One ounce if full fat, full flavor cheese puts more of a dent in my diet than a processed cheese, and the cost is way more expensive to buy a block of cheese that is full fat, and a light string cheese. For me at least- it's not like I can buy an 8 dollar block of cheese (store brand) and stretch it as far as I can a 24 pack of $5.30 processed cheese. bleugh! processed rubbish. cannot be good for you.